For this article, I had to brush up my middle-school geography with the aid of online sources and - in fact - my middle-school books on geography. I hope that it was worth the effort and that I can give some useful information on topography and other features of Austria. It′s meant to be only a concise introduction anyway. I will therefore focus on the physical geography and neglect social and economic issues. Austria is a landlocked country with a great variety of different landscapes: It has access to the largest Lake of Europe (Lake Constance or Bodensee), some of the highest mountain ranges of the Alps, hilly areas north and south of the Alps and extensive plains and the large steppe lake of Lake Neusiedler See. This is particularly surprising if you consider Austria′s size: It measures approximately 600 kilometres in its longest, East-West extension. The country is often divided into three major areas. The Alps themselves and their wider extensions into North, East and South, covering some 62 percent of the country (I find that number suspicious - I think you have to be fairly generous with that measure, or use purely geological criteria). The Alpine Foreland and the Austrian part of the Pannonian Plain, including some smoothly hilly areas (about 28 percent of the country). And finally the area North of the Danube ("Böhmerwald") stretching towards the Czech Republic and Slovakia; the ground here is derived from a granite mountain range (makes the remaining 10 percent of Austria. 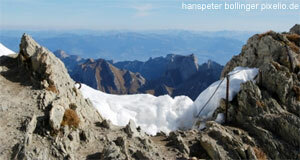 The Alps can be divided into three mountain ranges that differ geologically and in other features. Running in an East-West orientation, these ranges are the Northern Calcareous Alps, the Central Alps (granite base, the highest mountains of Austria are part of this range) and the Southern Calcareous Alps. With the Central Alps being the highest range, the altitude of mountains decreases the further South or North you go from the centre. The Alps also "flatten" out from the West (where they are higher) to the East. Essentially, the Alps explain the low population density on the national average and why the crowds settled North-East of the mountains or along valleys (especially in Vorarlberg, Tyrol and Salzburg). About 10 percent of the entire nation is either extreme alpine terrain, or beyond the tree line and therefore, unsuitable for agriculture. Forests cover another 40 percent of Austria. Crossing the Alps has been achieved at mountain passes for centuries. The most important passes are the Semmering Pass connecting the region of Vienna with the Mürz and Mur valleys (access to the South). The Pyrhn Pass between Upper Austria and Styria, the Tauern Pass in Salzburg and the Brenner Pass in Tyrol cut through the Alps along a North-South axis. Major highways follow each of them, making them important transit routes for both domestic and international traffic. The non-alpine regions of Austria are divided into the Northern Alpine Foreland; the hills of Northeastern Austria; and the Southeastern Alpine Foreland. The Northern Alpine Foreland is characterised by the Danube Valley. The Danube (in German "Donau") is the biggest river of Austria and runs across the country from West to East. It is the only major river in Europe that follows this direction. The Alps act as a watershed and all major rivers North of the central mountains contribute to the Danube. This includes the Tyrolian Inn, the Salzach in Salzburg, and the Enns in Upper Austria. Rivers south of the central mountain range contribute to the River Drau, which flows independently to Serbia, where it finally empties into the Danube. The economic role of the Danube as a waterway has increased in recent years mostly through the opening of Eastern Europe after the end of communism, partly due to the Rhine-Main-Danube Canal in Bavaria, which allows direct traffic anywhere between the North Sea and the Black Sea.